Our product range includes a wide range of chlorhexidine gluconate gel. 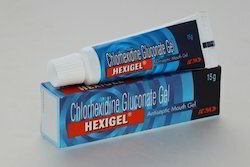 Hexigel Mouth Gel is used in the treatment of mouth infection. Take this medicine in the dose and duration as advised by your doctor. Check the label for directions before use. Hexigel Mouth Gel is an antiseptic that binds strongly to the surface of teeth, inner cheeks and gums. It works by killing the harmful microorganisms that cause swollen gums, tartar, bad odor from mouth, and other mouth infections. Pregnancy Weigh Risks Vs Benefits Hexigel Mouth Gel may be unsafe to use during pregnancy. Lactation Hexigel Mouth Gel is probably safe to use during lactation. Limited human data suggest that the drug does not represent a significant risk to the baby. What If You Miss A Dose Of Hexigel Mouth Paint? If you miss a dose of Hexigel Mouth Gel, please consult your doctor.